One of Alberta’s most stunning natural settings is Writing-On-Stone Provincial Park. Located in Alberta’s southeast quadrant, the park features a rich landscape of grasslands. It also boasts a wide variety of animals, birds, and amazing hoodoos, as well as centuries old native stone carvings. It is an important area for First Nations’ peoples and hosts thousands of visitors each year. 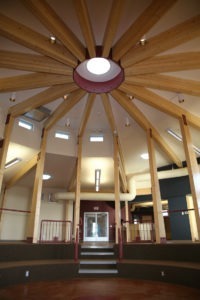 Alberta Infrastructure began to plan a new Visitors Centre for the area, but needed one that could withstand harsh climatic elements: strong winds, months of cold winter temperatures, and very hot temperatures in summer. The Insulspan staff worked with Calgary, Alberta-based architectural ﬁrm Sahara Hutchison Brzezinski (now Sahuri Architects) and Keller Construction to ensure excellence in insulation that would meet the LEED® certiﬁcation standard. 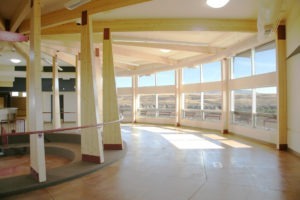 The building’s design called for a circular building that offered panoramic views which had cultural signiﬁcance for Blackfoot Nation. Thus, a series of wedge-shaped panels ﬁt together in the shape of a circle, building the roof. Additional key design requirements included superior insulation (R-Value), durability, and ease of installation. Joanne Perdue, a consultant and LEED® specialist, also attended the meetings. First, Insulspan supplied load span tables, which predicted strength for the walls. Second, Insulspan recommended the type of LEED®-approved sealant to use with the Insulspan SIP panels. Third, the client and architects toured the Insulspan plant in Delta, B.C. The tour allowed them a ﬁrsthand look at product creation. It was also an opportunity for learning about Insulspan product application. Then, the Writing-On-Stone project went to tender. Once Insulspan’s quote was accepted, the team worked closely with Project Manager Joanne Foster at Keller Construction, providing an AutoCAD layout. Finally, the entire project team reviewed the plans together, planned the electrical system, and made a decision. The walls would have electrical wiring run through the middle of the SIPs panels. The roof panels, however, would have it on the outside, simplifying the process. At the site, Insulspan supplied an on-site advisor for ﬁve days to train and ensure proper installation of the SIPs with the local crews. The Site Advisor later returned with the consulting engineer, inspecting the entire job and offering a letter of review.